Final exhibition in Väre 2F exhibition space. The course Manufacturing Technologies and Materials in Studio Production is taught and supervised by Eeva Jokinen, Leena Juvonen and Nathalie Lautenbacher. 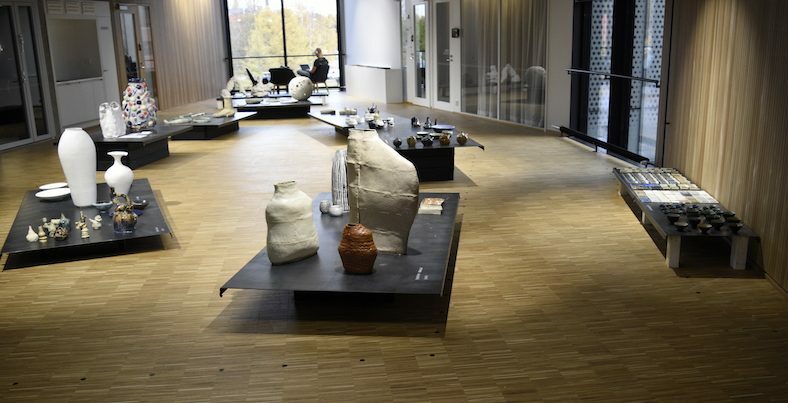 In the beginning of the first period, I went to the new ceramics workshop in Väre to ask for a working permit. There was a ceramics class going on at that time. I’ve been interested in ceramics course since I tried out ceramics by myself in May. I asked the teacher if I could attend the course and luckily there was still a free spot. Until later on, I realized the course was ‘Manufacturing Technologies and Materials in Studio Production’ and taught in Finnish for undergraduate students in Design Program. Kindly, the teachers gave me instructions in English separately. We learned all the basic skills of ceramics works. It included how to throw on the wheel, hand build sculpture, experiment on glaze and so on.